To Russia With Love - ??? If Ourumov kept going on, we would have enjoyed seeing Palace Square once again. Instead, he cut to the chase (no pun intended), went in another direction, skipped a few miles, and drove by Cathedral of Transfiguration to get lost in little streets behind it. 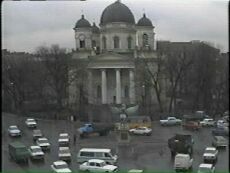 In reality, there is such a cathedral, it's located close to the USA Consulate, downtown, but not too close to where the previous scenes took place. 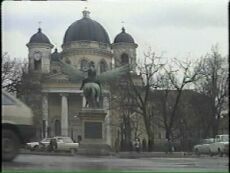 While some of the footage was filmed on location, the square in front of it is not as big as the one we see in close-ups. In the absence of Pegasus, it's used to park tour buses. 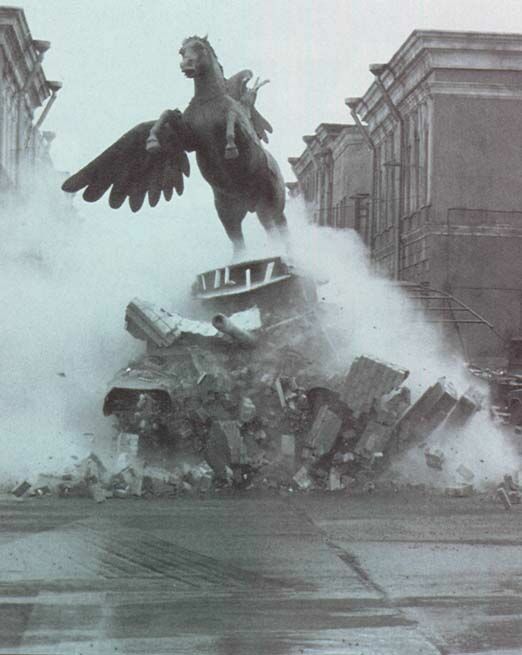 (*) Some say the Pegasus Rider is actually Czar Nichols II. I suppose those who made up the statue should know. However, it's just a rumor, so let's stick to the facts. 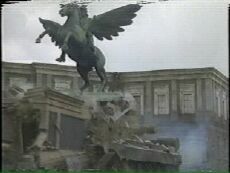 Pegasus is the only known horse that posesses wings but not a horn, and whoever rides it is a Pegasus Rider, even if he's a Czar.